Can the “Green New Deal” save the planet? It is never comfortable to give up long-held beliefs and connections, but the impending climate crisis makes that a burning necessity. And the fact that, scientifically, it’s possible to avoid the worst of this climate disaster gives a positive incentive to do so. 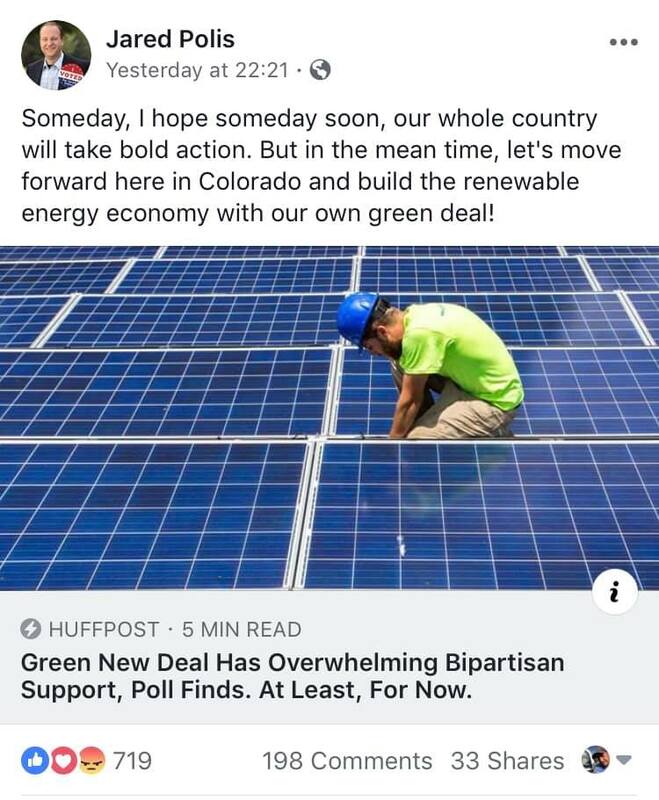 It is with this attitude that we must consider the “Green New Deal” as proposed by Representative Alexandria Ocasio-Cortez. The idea of a “Green New Deal” has been around for quite a few years. Over ten years ago, NY Times columnist Thomas Friedman called for it as did Van Jones, former (short lived) member of the first Obama administration. In fact, Jones wrote an entire book on the issue. In Ocasio-Cortez’s plan, the US would be weaned completely off of fossil fuel by 2030. So far, so good; this goal is possible. The question is how? 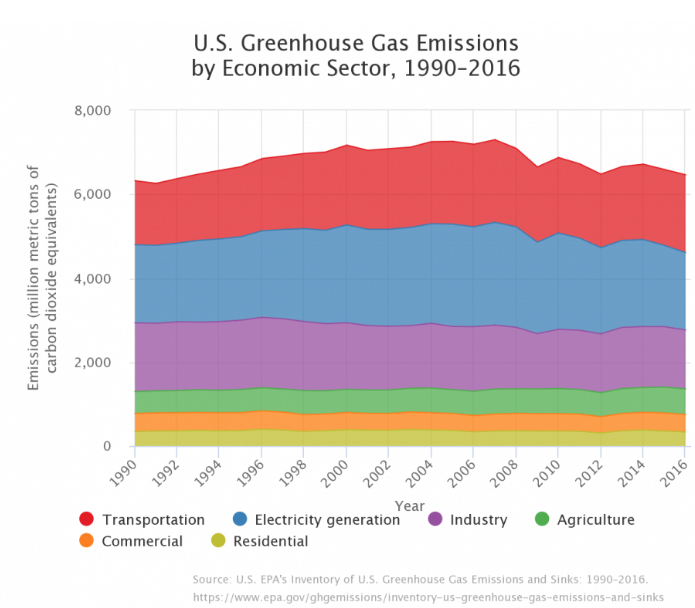 Transportation: The main cause of greenhouse gas (GHG) emissions in this sector is from the internal combustion engine and reliance on individually-owned cars. The second half of the pamphlet “The Environmentalist Manifesto” explains how this was inherent in the development of US capitalism itself. Transformation to reliance on mass transit and electric engines would only be accepted if it were accompanied by a massive reduction in the work week with no loss in pay and to making it affordable to live near the average worker’s work place. Electric generation: The electric power companies have fought for years against development of alternatives. Nuclear energy is not an alternative, if for no other reason than that it takes an average of about ten years to simply build a nuclear power plant. (In actuality, there are many other reasons.) To really develop renewable sources on a mass scale requires a total transformation of investment priorities. All the major capitalist interests have opposed and will continue to oppose this. As we explain below, the semi-official position of all wings of the Democratic Party is to even further develop use of natural gas to produce electricity. Manufacturing: The one major manufacturing industry remaining in the US today is auto. As we see above, those capitalists will oppose transitioning away from an automobile-based reliance. Overall, what is needed is the end of an economy that depends on producing ever increasing amounts of goods. But that is exactly what capitalism is based on. 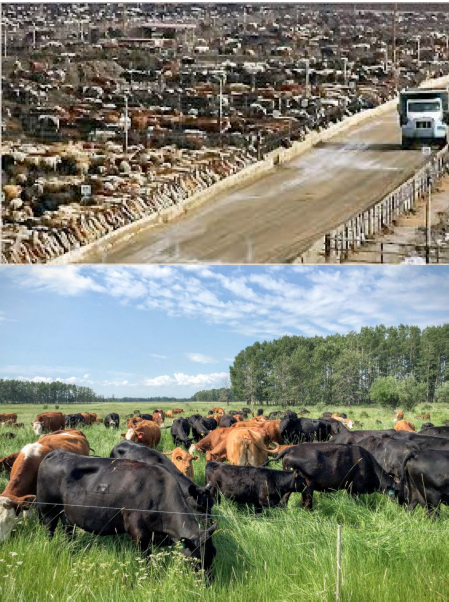 Raising cattle by feedlot vs. “mob grazing”. The second is far more natural and healthier for both the animals and the soil. massive amounts of pesticides and chemical fertilizers and meat animals raised in feed lots. Even the US government demands this through their requirements for farmers to be eligible to receive price support subsidies. The alternative is use of non-ploughing seed drills, use of cover crops and allowing animals to graze on open fields. Among other things, this would enrich the soil and allow it to massively capture carbon dioxide from the atmosphere. According to Michael Pollan (“Omnivore’s Dilemma”), adoption of these methods would remove 14 billion pounds of carbon from the atmosphere per year! Overall: Overall, reduction in emissions from one of these sectors is interlinked with the others. For example, reduction in manufacturing emissions cannot be accomplished without a transformation of the electricity sector. What is required is a general plan, organized, managed and controlled by the working class itself. 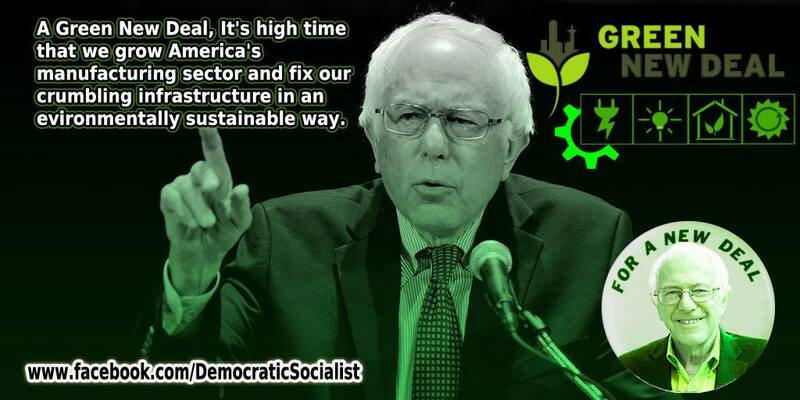 Can the Democrats’ Green New Deal – as depicted here by DSA – meet these expectations? Her Plan proposes that the government could raise the money through “traditional debt tools” (i.e. federal deficit spending) as well as creating new public banks. She also calls for “the government to take an equity role in projects.” In other words, public/private partnerships. To understand whether this plan can succeed, we have to start with the current state of global warming/global climate change. The Fifth Report of the main scientific international panel on climate change – the International Panel on Climate Change (IPCC) — explains how great the danger is: As the extreme cold in midwest United States this winter (2019) shows, what we’re really facing is global climate disruption – extreme cold in some areas, heat in others; flooding in some areas, drought in others. Overall, as the Earth warms, though, this warming will tend to feedback on itself. For example, as the tundra in the North thaws, it releases the greenhouse gas methane, which then causes even more warming. Despite this, all the IPCC report raises are very moderate changes, such as only reducing industrial output of greenhouse gas by 25% by 2050. 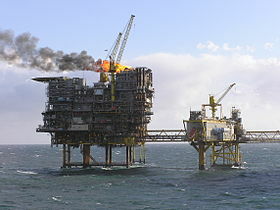 An article in the Guardian newspaper reveals the reason: They write that to reduce carbon pollution to down to zero by 2050, “would require (fuel) prices that are three to four times higher than for a 2C target.” There is no chance whatsoever that there would be popular support for such price increases. Surely, the Yellow Vest movement in France has proven that. First is government financing of private investment through increase in public debt. In effect, this is a return to Keynesian economics. The Keynesian strategy died in the United States under threat of runaway inflation in the late 1970s. This signaled a new world situation. It means that Keynesianism cannot be raised from the dead. One alternative would be to try to make the working class pay for it, as has French President Macron. We see the results there! Workers simply cannot afford to do so. The other is to make the capitalists pay, but they will never give up their profits voluntarily. Even more important, the entire issue of global climate disruption directly leads to the issue of the “free” market and production for profit in a planless economic system. To quote R2D2, “danger, danger!” How can the capitalist-controlled Democratic Party ever push through a Green New Deal, given these political realities? And so, the issue of preventing an all-out climate disaster is political, not scientific. That is the lens through which we must look at Ocasio-Cortez’s Green New Deal. For starters, what was the original “New Deal”? 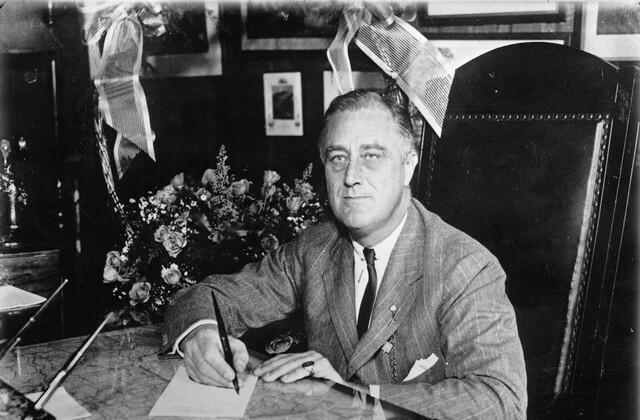 First coined by FDR, it was nothing but a “happy phrase… (that) made people feel better” as Art Preis quoted FDR’s own Labor Secretary Frances Perkins in his (Preis’s) classic US labor history, “Labor’s Giant Step.” Similar to the bank bailout after the 2008 collapse, Preis explains that FDR’s first step was to bailout the big banks at the expense of the depositors and the small banks. Whereas by 1945 FDR was spending over $100 billion per year on war, his “Emergency Relief Act” spent only 0.5% of that amount ($500 million) on jobs, and jobs at a pittance as far as wages were concerned. In fact, FDR’s New Deal did little to nothing to relieve unemployment; it was the coming of WW II that lifted the US economy out of Depression, and what a cost that was. It is no accident that from Van Jones to Ocasio-Cortez, the “solution” to climate disaster is phrased in the tradition of FDR’s New Deal, nor that this proposal comes from the liberal wing of the Democratic Party. An alignment of forces similar to in FDR’s time is backing Ocasio-Cortez’s Green New Deal. The reform wing of the Democrats – the “Justice Democrats” (who were the ones who recruited Ocasio-Cortez to run in the first place) show this. 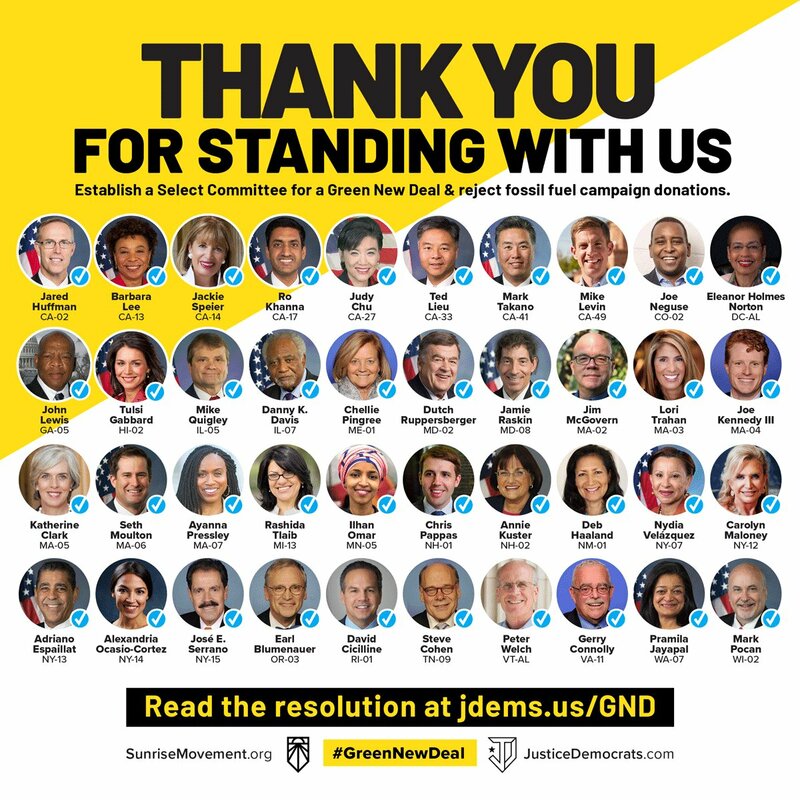 Those they thank for endorsing Ocasio-Cortez’s Green New Deal include long time mainstream Democrats (like Jim McGovern and Dutch Ruppersburger) and establishment liberals (like Jackie Speier and Ro Khanna). These representatives all get donations from major corporations like Yahoo, Google and Facebook. (For some examples, see the appendix at the end of this article.) And as for the union donations, they are arranged through the union bureaucracy, which will ensure that she does not move away from the Democratic Party. 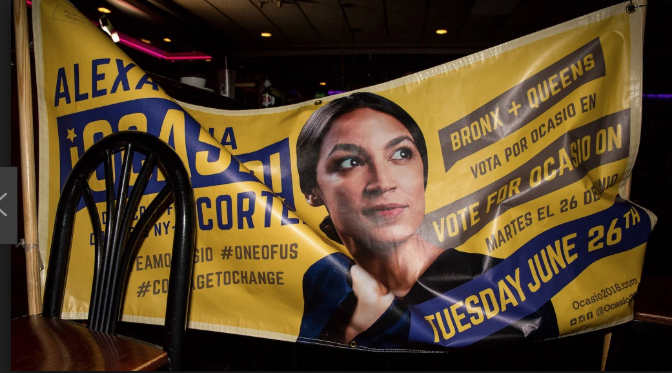 The “Justice Democrats”, who recruited Ocasio-Cortez to run for office, thanks the backers of the Green New Deal. They know full well that it won’t pass. Central to Ocasio-Cortez’s strategy is the proposal of a “Select Committee” that would act as a “quarterback” as she puts it. This committee would centralize and coordinate all the legislation aimed at eliminating the use of fossil fuel by 2020. Initially, nearly the entire “Progressive Caucus” of the House Democrats opposed the formation of this Select Committee. Corbin Trent, spokesperson for Ocasio-Cortez commented that on this basis this committee is “about as useful as a screen door on a submarine.” He is wrong, however. It is enormously useful. It creates the illusion of change without really doing anything. Military spending is slated to eat up nearly 2/3 of the 2019 federal budget. 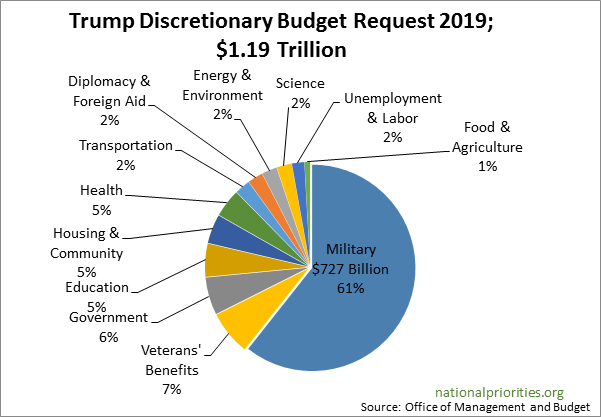 It’s mighty odd that cutting military spending isn’t mentioned as one source of funds for the Green New Deal. There is also a glaring absence in the Green New Deal proposal: There is no discussion as far as shifting budget priorities. Most particularly, there is the $716 billion in the 2019 budget slated for the military. This is nearly ¼ of the total federal budget for 2019. Many of these mainstream liberals would strongly oppose any significant reduction of this part of the budget, but as long as the US spends that sort of money on war, it’s hard to see how there is room for any other sort of priority. The history of the Democratic Party in relation to fracking and natural gas development is central to understanding the orientation of that party in general. This history is intimately tied in with the recent history of the Democratic Party in the State of Colorado.i There, a group of four multi-millionaires, known as the “Gang of Four,” organized to take back power in the state from the Republicans. They were connected with the oil and gas industry in the state, and they were so successful that the Democratic Party nationally formed an equivalent group of multi-millionaires called the Democracy Alliance. (For more detail, see Appendix II.) Basically, it is the story of how the use of natural gas came to be the Democrats’ fallback position on energy development. Tweet from newly elected Colorado governor, multimillionaire Jared Polis. A member of the Gang of Four, he talks a nice game while he encourages further development of natural gas through fracking. This “Democracy Alliance” linked up with some of the major environmental NGO’s such as the Sierra Club, whose “Beyond Coal” campaign then morphed into a campaign for “low carbon substitutes” and “clean fuels and renewables”. These and similar terms have become dog whistles for natural gas. In 2006, the Democracy Alliance secured the election of a Democratic governor, and in 2010 that governor was replaced by the out-and-out oil representative, John Hickenlooper, Democrat. Natural gas has been branded as the “bridge fuel” by the industry and their Democratic Party representatives. This implies that it is a bridge to transitioning to renewable fuels. In fact, it is the opposite. That’s because, by cheapening the use of fossil fuels, it has discouraged investing in renewables. In the 2018 elections, Colorado Governor John Hickenlooper was replaced by Jared Polis, one of the members of the Gang of Four in that state. A truly slimy character, Polis made his first millions speculating on the privatizing of the state monopolies in the former Soviet Union. He made something of a public reputation in Colorado after he got involved in the opposition to fracking… when the gas industry moved to frack some gas wells right near his multi-million dollar vacation home in Weld County, CO. A case of a NIMBY if there ever was one! However, his turnaround was rapid and he became known as a sell-out by the “fractivists”. In 2012 the Obama administration made dependency on natural gas the semi-official policy of the Democratic Party. They issued a report on the need for “clean energy”. That term is often linked with the call for “energy independence” and taken together they mean nothing but the increased use of natural gas. That use is inescapably linked with increased fracking, which is massively environmental destructive. For example, fracking is linked with damage to the development of the brain and the immune system in young children. Also, due to the release of methane gas in this process, fracking may be even worse than coal as far as global warming is concerned! The conclusion is inescapable: What Ocasio-Cortez proposes will be inadequate compared to what is needed to prevent climate catastrophe. Even the limited steps she proposes cannot be accomplished through the Democratic Party, not even with the “pressure” of the leadership of the unions and the environmental NGO’s, upon which she and her proposals rely. There are potential solutions, as explained in the outline at the start of this article regarding electric generation, transportation, manufacturing and agriculture. Nothing less than the complete socialist transformation of society is necessary. Bernie Sanders and his liberal wing of the Democratic Party often point to the Scandinavian countries as an example of socialism. Proof that these countries are no solution lies in the fact that both Denmark and Norway rely on oil production for a major portion of their economies! No, what socialism means is taking the commanding heights of the economy out of private hands and planning production under the democratic control and management of the working class itself. This cannot be accomplished through the present capitalist-controlled state. In fact, the “Founding Fathers” drew up the US Constitution in order to structure the government in such a way as to prevent the working class from controlling it. What is necessary is a new form of government that can arise in the course of the struggle of workers themselves. Reformists and liberals will claim that this means an “all-or-nothing” approach. They call this “letting the perfect be the enemy of the good.” That is nonsense. If we are not clear on the necessary destination of the journey, then we will inevitably be led down one cul-de-sac, one dead-end road after another. We do, of course, also have to be clear on how to start. In 1886, Karl Marx’s co-thinker Frederick Engels wrote “The first great step of importance for every country… is always the organization of workers as an independent political party, no matter how, so long as it is a distinct workers’ party…. The masses must have time and opportunity to develop and they can only have the opportunity when they have their own movement — no matter in what form so long as it is only their own movement…” The same applies today. 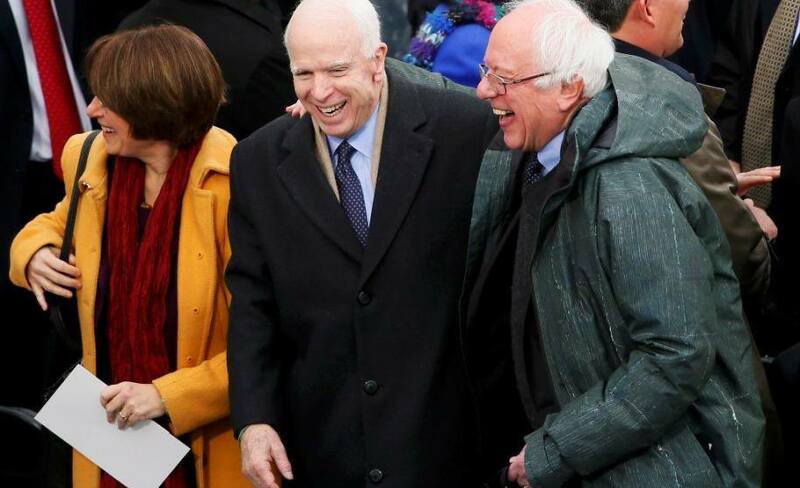 Nancy Pelosi, John McCain and Bernie Sanders getting along fine. Sanders will not and cannot lead a move for a working class party. According to Craig Unger’s book, “House of Trump, House of Putin”, the chief campaign strategist for Sanders 2016 presidential bid, Tad Devine, was formerly employed by none other than Paul Manafort and his infamous “Torturers’ Lobby”. The rest of his top staff, including Michael Briggs, Michaeleen Crowell, Jeff Weaver, Phil Fiermonte, Scott Goldstein and others are all Democratic Party operatives. Sanders entire political history has been based on an electoral and legislative alliance https://oaklandsocialist.com/2016/01/14/can-sanders-break-from-the-democratic-party/ with the Democratic Party leadership. Convulsive struggles like these are the traditions of the US working class. 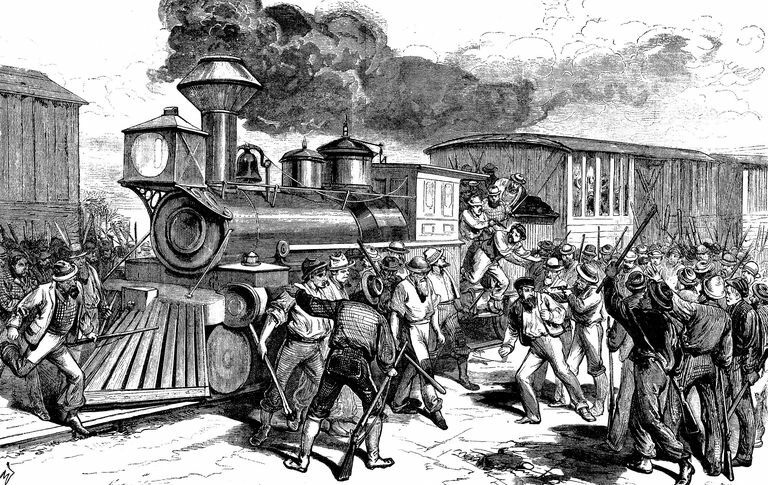 From the Great Uprising of 1877 to the West Virginia teachers strike of 2018, the US working class has a tradition of moving first by striking and otherwise mobilizing in the streets and at the work places. There is every reason to think that tradition will continue, despite the fact that the liberal/“progressive” wing of the Democrats is constantly trying to divert the working class into electoral and legislative support for them, and despite the fact that the leaders of the working class – the union leadership – represent these Democrats and are complicit in this attempt. 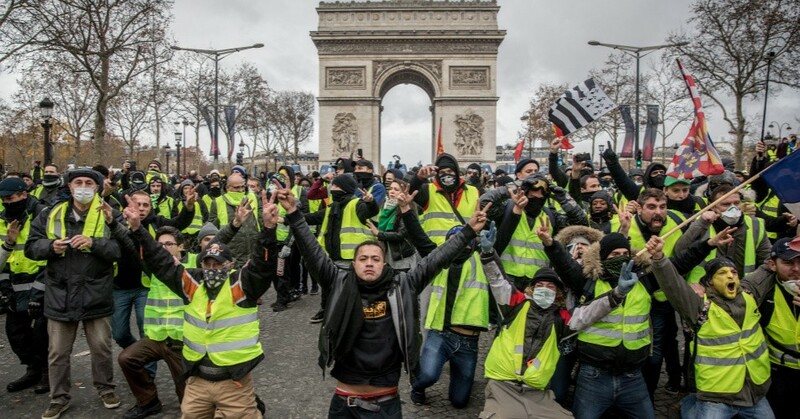 Yellow vest protest in France. Is a similar movement coming to the United States? happen here. There had been a series of strikes over the summer of 2018 in France. Similar to here, the union leadership there did everything in their power to limit the scope of these strikes. They successfully prevented these strikes from becoming the springboard to a wider working class movement against the attacks on French workers’ living standards – what is known as “austerity measures”. Here, we have seen a similar trend, first and foremost in the teachers strikes from West Virginia to Los Angeles. (As this is being written, Oakland’s teachers are preparing to go on strike.) As in France, the union leadership here were unwilling to build these strikes into a movement for higher wages for all and for a restoration of all the cuts in all government services. Similarly, the union leadership was more or less passive in the face of the federal shutdown, and what little they did do failed to link the issue of federal workers’ pay with the defense of immigrant workers, including asylum seekers. The leadership of the only nominally socialist group with any real presence – the Democratic Socialists of America – was equally complicit. Sooner or later, though, something will happen for the dam to burst, for a more generalized movement to develop in the streets. It may be some political crisis, including a possible international crisis such as a US military assault on Iran, or a particularly egregious case of police violence and racism on a scale not seen up until now or an environmental disaster far greater than anything we’ve seen up until now. It could be voter suppression on a scale unseen since the days of Jim Crow. Or it could even be some “accidental” event that just strikes a raw nerve. But whatever it is, it is hard to see how the present period of tense calm can last very much longer. When that calm shatters, then all hell will break loose. That could even lead to the calling out of the National Guard in cities throughout the United States. But what is such an organizational structure but the beginnings of a working class party? Not a party born through some academic like “plan”, but one born through the actual real-life struggles of hundreds of thousands, possibly of millions of workers and youth in the school of life. In time, and maybe a fairly short period of time, that working class party in the making will have to determine its orientation towards elections, even though it might not be born through participating in elections. Supporting the “left” leaning Democrats would be the death of this working class party in the making. Ignoring elections would have the same effect, since it would cede the ground to the Democrats. It would have to run its own candidates, maybe first at the local level. It is in this unplanned, chaotic, tumultuous and even violent road that the solution to the global climate crisis is to be found. 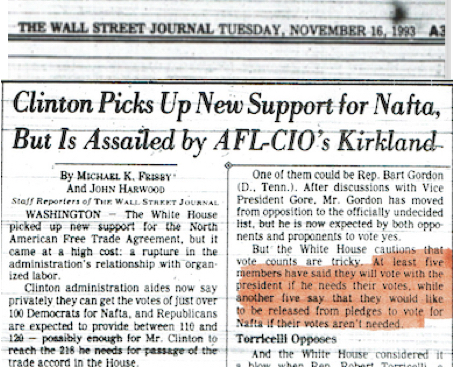 Wall St. Journal reports that nearly a dozen liberal Democrats only voted against NAFTA because they knew it was going to pass even without out their votes. The same NAFTA ploy is being perpetrated today with the Green New Deal. Some argue that while a working class party is necessary, until we have one we should support the likes of Bernie Sanders and Alexandria Ocasio-Cortez. Aside from the fact that this has always been the argument of those who in reality are trying to avoid building a working class alternative to the Democratic Party, this argument leads us down a dead-end street. Support for this wing of the Democrats has always led to adopting their methods. Those methods can be most clearly seen in the response to the 2019 federal government shutdown. All Sanders could do was propose sending a letter of protest to Republican Senate leader Mitch McConnell. In fact, what was needed was mass protests at federal offices and at airports around the country – protests that linked the nonpayment of 800,000 federal workers with the recent raise that all federal workers were supposed to get but that Trump vetoed and the need for a substantial raise for all workers. This should have been linked with opposition to the Wall and the demand for release of all asylum seekers. Instead, aside from a few small protests at a few airports, the union leadership was passive. Following their lead, so was the only socialist group which has any influence, Democratic Socialists of America. As every new issue arises, we have to be sure not to be passive again. Build the mobilization of workers and working class young people in the streets and working class communities and schools. Help rank and file union members build opposition caucuses inside their unions. Support and help widen strikes and other actions of workers. Within all of this, help to clarify what capitalism has in store for our planet and how only the working class, through its conscious and independent activity, can avert the looming capitalist disaster. Should Socialists Support Nuclear Power? https://oaklandsocialist.com/2013/11/26/should-socialists-support-nuclear-power/ explains why that form of energy production is no solution. Section two of The Environmentalists’ Manifesto https://oaklandsocialist.files.wordpress.com/2013/08/complete-pamphlet2.pdf explains how the automobile-based US transportation system developed. Oaklandsocialist has had a number of articles https://oaklandsocialist.com/?s=fracking on the environmentally disastrous process of fracking. We have covered both the environmental effects as well as the movement against it. What is socialism? https://oaklandsocialist.com/2013/10/27/what-is-socialism-2/ is a Marxist explanation of socialism. It contrasts with the popular answer given by liberals like Bernie Sanders. What Happened to our Unions? https://oaklandsocialist.com/2013/06/06/what-happened-to-our-unions/ explains how the union leadership came to see itself as the defenders of the employers inside the unions. Also, Oaklandsocialist has a number of articles https://oaklandsocialist.com/category/labor/ on the labor movement today. Dutch Ruppersburger (D, MD), Jim McGovern (D, MA), Jackie Speier (D, CA), Ro Khanna (D, CA) and Rashida Tlaib (D, MI). The first, Ruppersburger, is hardly known as a “reformer”. Overall, his major source of funding has been the arms industry, from which he received nearly a quarter of a million dollars. Jim McGovern, the powerful chairman of the House Rules Committee, has as his top four donors, Union Pacific Corp., Raytheon Co., Dell Technologies, and the National Association of Realtors. Then there is Ro Khanna, who was the candidate of the Silicon Valley capitalists, including Yahoo CEO Marissa Mayer, Facebook exec Sheryl Sandberg, Google Chairman Eric Schmidt, and venture capitalist Steve Westly. He and his fellow California Democrat Jackie Speier could be considered to be the reliable liberals in the Democratic caucus of the House. Speier, in turn, raised $892,143 from large individual and PAC donations. An example of those large such donors is SV Angel LLC, which explains that it helps companies with “business development, financing, M&A and other strategic advice”. Even one of the foremost insurgents, Rashida Tlaib, is not free from these clutches. She received $15,000 from Eagle Canyon Capital, which is a property management company focused on managing properties rented or owned by Silicon Valley capitalists. And as for Ocasio Cortez, although the majority of her donations came either from small donors or from unions, even she received over $6000 from Apple, Inc. and $5,000 from the National Association of Realtors. Some of these above donations may have been from PAC’s, over which the candidate has no control, but it is significant that they donated these funds. They don’t donate out of a sense of philanthropy. 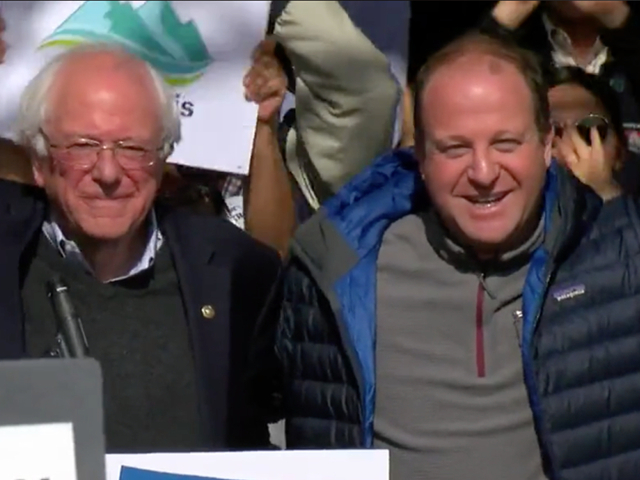 Despite this history, Bernie Sanders spent several days touring Colorado prior to the 2018 elections, campaigning for Polis. This should come as no surprise, as his “Our Revolution” also called for people to “Join the fight to get Raul Grijalva elected”. Raul Grijalva (D, AZ), chair of the House Natural Resources Committee does not support Ocasio-Perez’s Green New Deal. The AFL-CIO supported the Keystone XL Pipeline, and a series of general presidents of different unions https://oaklandsocialist.com/2016/09/08/north-dakota-protest-and-organized-labor/ actually urged the governor to in effect increase the police brutality meted out against the protesters. The national AFL-CIO also called for expansion of the oil pipeline “infrastructure”. In 2013, the Illinois State AFL-CIO joined with the state Chamber of Commerce to ensure that fracking https://oaklandsocialist.files.wordpress.com/2013/08/complete-pamphlet2.pdf could be carried out in that state. Key to almost everything related to global warming is construction, and that’s where the building trades comes in. The building trades leadership has a long, long history of supporting every single proposed construction project as long as it will be built union. In a key conversation https://oaklandsocialist.com/2017/10/18/oakland-as-stadium-proposal-save-laney-college-stop-gentrification/ this writer had with a Latino leader of a largely Latino laborers local, that union official could not even commit his union to opposing the construction of Trump’s Wall if it were to be built union! Under the present leadership, organized labor, therefore, will not be a reliable partner in fighting for a real transformation of the oil-based US economy. What is required is an internal rank and file struggle to completely transform the unions from top to bottom. Neither Ocasio-Cortez nor any other elected Democrat will support that struggle, partly because it is exactly that present leadership that provides significant funding. More important, the entire left liberal wing of the Democratic Party relies on the political status quo to continue playing the role it does. An integral part of that status quo is a labor movement held in check by its own leadership. Nor will the major environmental NGO’s provide that impetus. Together with the State AFL-CIO, it was the Big Green NGO’s like the Sierra Club that eased the way for fracking in Illinois. Typical of these Big Greens is the Sierra Club. At one time, they were receiving funding from Chesapeake Energy, a natural gas company. When that hit the light of day, that funding ended, but a major source of funding for them continues to be the Democracy Alliance (discussed above) as well as other Democratic Party linked foundations. Another example is Food and Water Watch. This group has links with such individuals as Republican capitalist Richard Goldman and Roy Hampton Park, co-founder of Hines-Park Food. Park is listed as the 40th richest person in the US by Forbes. And as part of agribusiness, he would oppose any campaign to transform the agricultural methods as explained below. Good and thorough analysis. The worker’s party begins with work like this.